Cannock Chase district now has near total fibre broadband coverage thanks to a county council scheme with most of Staffordshire also able to connect. The Superfast Staffordshire programme, run jointly with Openreach and the government’s Broadband Delivery UK (BDUK) programme, has helped to enable 99.3 per cent of Cannock Chase to connect to speeds of 24mbps and above – enough to stream ultra High Definition videos or download 200 photos in less than a minute. So far, Superfast Staffordshire has enabled around 75,000 households and businesses to connect to superfast broadband speeds. The figure rises to more than 478,000when combined with fibre rollout under commercial programmes. “Connectivity enables people to live independently and grow more prosperous whilst boosting economic growth and productivity. “Our Superfast Staffordshire has played a vital part in the delivery of fibre broadband in the county and we are pleased to hit the 95 per cent coverage mark in November, ahead of the national programme. It’s fantastic that one of our districts has near total coverage with the rest of the county pretty close. We’re really urging people now to contact a broadband provider and get connected. 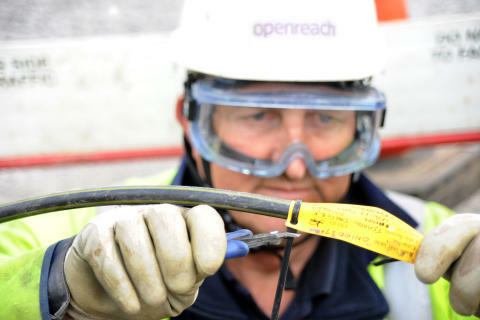 Kim Mears, Openreach’s managing director of strategic infrastructure development, said: “Deploying fibre broadband to even more of Staffordshire’s smallest, most remote premises can be very challenging and often involve a mixture of complex technologies and processes. But we are working successfully in partnership with local communities to get access to agricultural land and roads in order to ensure our project teams get this new network installed. Issued by Staffordshire County Council and Openreach on behalf of Superfast Staffordshire. Superfast Staffordshire is a partnership between Staffordshire County Council, the Government’s Broadband Delivery UK programme (BDUK) and BT Group. It builds on the commercial roll-outs in the county. In the second phase of the programme - known as the Superfast Extension Programme - a total of £10.18m will be spent to deliver superfast fibre broadband to around 12,700 more county premises (£2.7m from unallocated funding combined with cost efficiency savings during contract 1, £2.18m from the Department for Culture, Media and Sport’s Superfast Extension Programme, £2.8m from BT Group together with an extra £2.4m also from BT Group following higher than expected take-up of fibre broadband). This will take the percentage of county premises able to access superfast fibre broadband by the end of 2018 to 96 per cent. Superfast Staffordshire is using a mixture of technologies. These include Fibre-to-the-Cabinet (FTTC), which provides download speeds of up to 80Mbps and upload speeds of up to 20Mbps, and Fibre-to-the-Premises (FTTP), which is capable of delivering download speeds up to 1 Gigabit per second (Gbps) and upload speeds of up to 220Mbps. Speeds referred to are the top wholesale speeds available from Openreach to all broadband service providers; speeds offered by service providers may vary. 3.£150m to improve quality and coverage of mobile phone and basic data network services.